Organized by The Hong Kong Institute of Architects Biennale Foundation, in conjunction with The Hong Kong Institute of Architects, Hong Kong Institute of Planners and Hong Kong Designers Association, and with Create Hong Kong of the HKSAR Government as the lead sponsor, the 2017 Bi-City Biennale of Urbanism\Architecture (Hong Kong) is opened from December 12 until 11 February 2018. Under the theme of “City Smarts: Density 2.0”, the two-month long exhibition will take place at a total of 9 venues in Hong Kong and Shenzhen for public viewing. As part of the theme to “improvise”, and to demonstrate the potential of vacant or shared spaces and frontages in the city, UABB (HK) 2017 is popped up in 9 highly accessible local urban vacant or shared locations and cultural hubs in Hong Kong and the main venue of 2017 Bi-City Biennale of Urbanism\Architecture (Shenzhen) in Shenzhen, with MTR as the connecting spine for the 8 local venues. The multiple venues provide a territory-wide platform for exchange and discussion about the sustainability of Hong Kong’s architectural and city planning. With more than 80 exhibitors in this edition, contributions from both academia and industry sectors are featured in the exhibition, including architects, planners, ecologists, fashion and product designers, filmmakers, photographers and students, etc. The wide scope of exhibits covers artworks and installations, spotlight designs and architectures, and interactive exhibits that use augmented technology to connect with the public. During the 2 months of exhibition, a series of community events will also take place at different venues for public engagement. 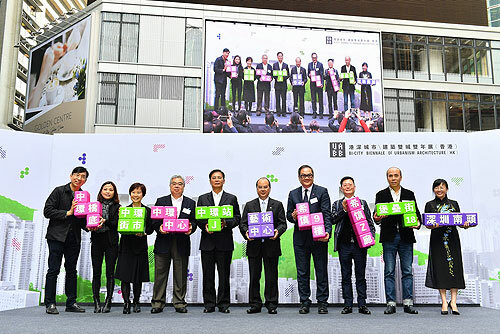 These community events, including Talks and Forum, Guided Tours and other public events and activities, are interactive and serve as a bridge between local public and industry professionals to exchange and to explore solutions to Hong Kong’s current problem of land shortage in a more appreciative and inclusive way.